Adding compact size and portability to the revolutionary FT-ONE 4K UHD high speed camera, the FT-ONE-LS/FT-ONE-LS-12G separate the camera head from the body, offering exceptional mobility, and enable unprecedented shooting positions or angles for live sports or other events. With a 2/3-inch lens, the FT-ONE-LS offers improved performance in low light conditions, often found in sports stadium venues that can prove troublesome for most high-frame-rate cameras. FOR-A’s exclusive “flicker corrector” technology, offered as an optionalfeature, helps set this camera apartfrom all others. No longer will the effects of lowlight and high-speed 4K production be a concern when shooting night games or in domed stadiums. Supports 8 x SSM in 4K 60p or 10 x SSM in 4K 50p, works with a dedicated video server. 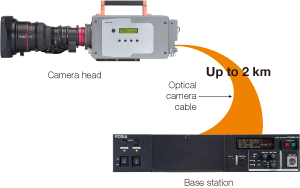 Simultaneous output of live and super slow-motion video makes FT-ONE-LS/FT-ONE-LS-12G more than a dedicated high-speed solution. The cameras are also ready for live workflows of all kinds. While playing back super slow-motion coverage, the operator has the ability to turn off the camera head and move around to capture the next crucial shot. Unbeatable versatility! This is especially useful when covering live action events requiring mobility. With its camera head linked to the base station over a single optical camera cable, the FT-ONE-LS/FT-ONE-LS-12G have a maximum extended range over a mile*1. Additionally, footage can be captured at the base station on no more than two SSD cartridges, with a maximum storage capacity of 4 TB. 1 When using a camera cable longer than 1 km, an external power supply may be necessary. The internal memory can be used as a single partition or divided into 2-16 partitions for simultaneous recording or playback. For continuous recording, material can be left intact prior to recording the next segment. Partitioning allows the operator to record new scenes while playing back already recorded ones. As soon as the FT-ONE-LS/FT-ONE-LS-12G is turned on, video is constantly being buffered by the camera and can instantly be saved to memory with the push of a button. Choose the optimal recording trigger for the subject or scene by selecting from a start, center, or end trigger or by specifying the start time of the recorded segment. With the pre-roll function, playback starts from the specified position, keeping playback focused on required segments. The video operator will be awed by the amazing 24-axis color correction, offering improved camera and color matching compared to the usual trichromatic correction. 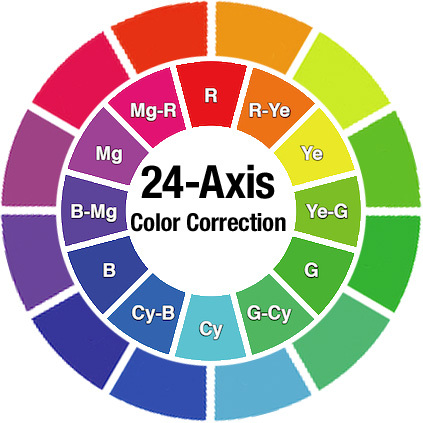 Specific colors can be corrected by adjusting hue and saturation separately on the 24-axis. This is very convenient for on-site color-matching between scenes, or when ensuring color consistency with video from other cameras. Choose from a variety of color presets*3 or, import your own. 3 For details, contact a FOR-A representative. Intercoms are indispensable when it comes to live coverage. With both a D-sub and XLR connector, the camera easily fits into live workflows, supports 2-wire, 4-wire, or Clear-Com® connections. Connected to EVS sports replay server, the FT-ONE-LS/FT-ONE-LS-12G provide impressive output of high-speed video. Material on the server can also be replayed as needed. The units also offers capability of long-duration recording in HD at 6x speed. High-quality video images are maintained even with gain increased for video captured with a 2/3-inch mounted lens. Operators will see significantly less noise, which tends to occur in low-light conditions. Output rates of up to 500 fps in 4K or 1,300 fps in HD are supported. The optional Flicker Corrector offered on the FT-ONE-LS, corrects, in real-time, that annoying flickering often put out by high-speed cameras when shooting under inconsistent lighting conditions. This option is a must-have for indoor live sporting events, especially when shooting night games or in domed stadiums or gymnasiums.